Keila, 23, is from San Pedro Sula, Honduras. She never got to go to high school. 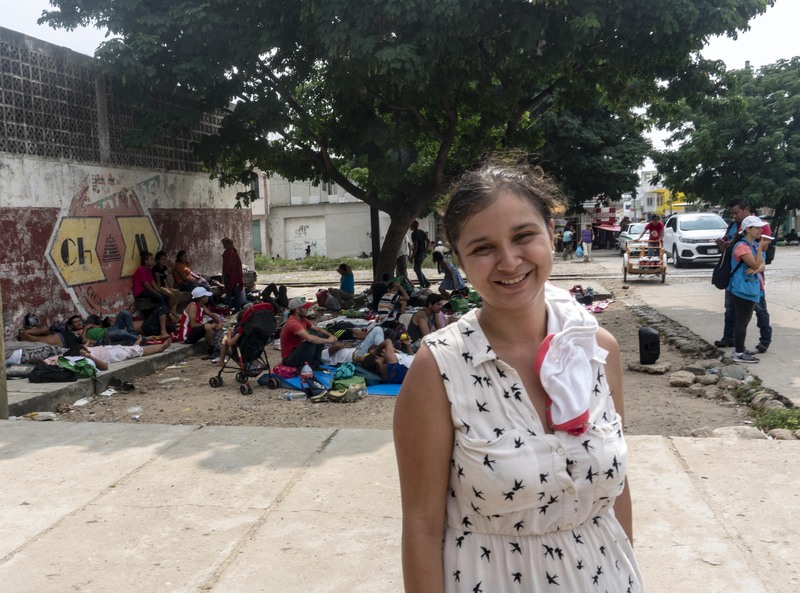 In Arriaga, by the tracks of the train known as la Bestia, the Beast, Kayla explained that she joined the caravan because her husband was abusing her, and when she reported him, police came into her neighborhood. Local gang members told her that if she didn’t leave, they’d kill her for bringing police into the area. One of them talked to me. He said, “Look, you better go, get lost. Because we don’t like it when the police come,” he said. He said, “Because sometimes we’re armed, and if the police come and take our guns, they arrest us. You better get lost before we kill you.” And that’s why I came. I reported my husband. And I have the report. Maybe that’ll help me, because I want to ask for asylum. Yocelyn and Marvin, from Tegucigalpa, Honduras are traveling with their two young children. They spoke about the routine police corruption and various financial pressures that families face every day. Yocelyn: [In Guatemala we had] have to give [the police] 100 quetzales, 150, 50… In Honduras it’s worse. It’s worse. 500 Lempira and up. Yocelyn: And you’re in your own country, you don’t have your documents on you. Marvin: If there are two cops, that’s 200 Lempira. And more! Whatever they say to you. And if not, they beat you. Yocelyn: Or they take you in the patrol car and you’re never seen again. Marvin: In Guatemala it was hard. We thought that we weren’t going to get past the border with Guatemala because there were a lot of checkpoints [to get out of Honduras]. Yocelyn: Once we got past the border, we were ok.
Marvin: Everyone. They’re happy, for more people to come. More money for them. It’s a business. They’re making good money, off the sweat of people. And we thought we’d have the most trouble with the police here in Mexico. Marvin: But the police themselves have helped us. They themselves. They’ve even given us rides. And the same with school. There’s no support. If you don’t have money… to cover all the expenses of school, you don’t study. It’s what they say [at the school], they don’t accept you. The same, if you go to the doctor, to the hospital or a health center, there’s never medicines. What they give you is a prescription for you to buy [medicine]. Yocelyn: You always have to pay, and you always have to buy the medicine. Marvin: It’s ugly. In this hospital in Honduras, La Hospital de Escuela they call it, you might go in with a foot injury, and you turn up with the dead. Yocelyn: So there’s more corruption. Because now, any police officer is corrupt. So,etimes they take people for not having their documents, they take them and they never turn up. The police show up to a house to do some search and they take people, who knows where they take people. They look for them in jails, they don’t turn up. Marvin: Not even in the morgues. Marvin: Years later, maybe, only the bones. Yocelyn: [Until recently] the food was cheaper, there was a little more work. Now food is very expensive. Marvin: Now an egg costs 4 lempira, 3.50. It used to be 1.50 four years ago. Now [President Hernandez] got himself re-elected. The other guy had won. That’s corruption. He wanted to stay, and he was able to. Marvin: There was a time, I think it was with [President] Zelaya that …there was a credit. Yocelyn: There was an education credit, too. And there were places kids could go after school to eat. But this president, no. And supposedly there’s a lot of aid from other countries, and we don’t see any of it. We don’t see it. And we pay the electricity. If we paid 500, we ended up paying 1,500, 1,800. Way too high. Way too high. Christian, 20, has wanted to emigrate for years after dropping out of middle school. Now, his sister’s situation makes the journey more urgent. She was forced to leave Honduras because of threats on her life after defaulting on a private loan. Jorge wants to work in the US to make enough to bring his sister home so she can be with her two young children who miss her desperately. Jorge also dreams of studying law or nursing. Well, I had many financial problems. I have a 27-year-old sister who had a problem, a big problem, and had to leave. She’s now living in Spain. She’s working. She left my two nieces. One is three and one is one and a half. That they wake up and tell you [in the middle of the night] ‘I miss my mother’s hugs,’ is pretty hard. So I said, I’m going to come with the idea of working to help my sister so she can be with her kids again as soon as possible. And I can help my family get ahead. Ever since my dad died I’ve always wanted to study. Unfortunately, in Honduras I’ve never had the chance because if you go into a public school, you also have to have a job. Because even if it’s public, you need money. The notebooks, the books and everything, etc., it’s all that money. And if you don’t have a job and if you don’t have [financial] support from your family you can’t do anything. When my dad died, I tried to study. We didn’t live near the schools, and I had to drop out half way through the year because it was very hard. I couldn’t continue in school because I had to pay fare to get transport to school. There were days when I had the fare, days when I didn’t. One day my mom even punished me because I got home at night from school because I didn’t have money for the bus so I had to find a ride. So when I got home she asked me ‘Why did you arrive at night? !’ But by the time I tried to explain she was already hitting me! I decided to drop out and the next year I got a job. It wasn’t a lot that I earned and I had to support my mom. I couldn’t study, so that’s my goal. Work, get ahead, and be able to study, because I’d like to get ahead. Nursing and law is what I like most. I’ve said since I left Honduras, I come believing in God. And I’m going to keep going. And I know that my dreams will come true with my faith placed in God. It’s been hard, but I’ve always said that in life, everything comes for a reason. And if you set yourself goals, you do it. And you really try to make them come true, you achieve them. Everything requires effort. Jorge, from Tegucigalpa was resting in the yard of a municipal gym in Pijijiapan as children played near a tree. 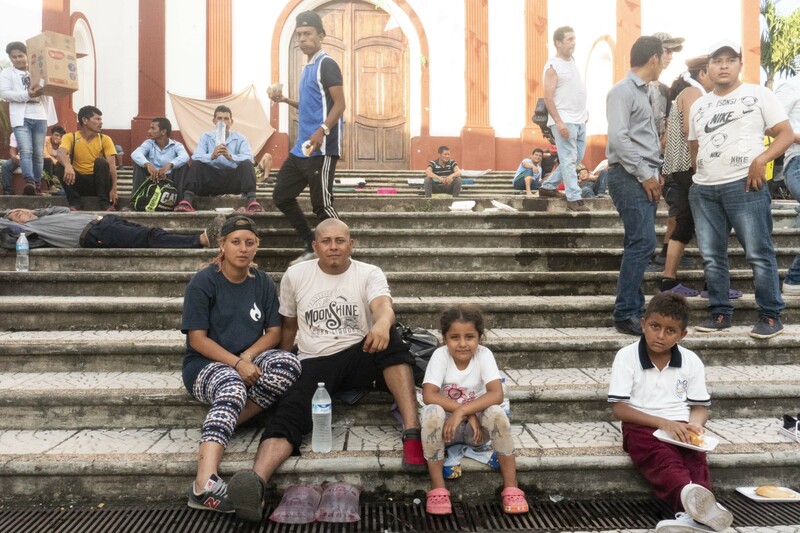 When the caravan began, he was in San Pedro Sula because just three weeks before he had been deported from Mexico after trying to reach the US. Jorge: [My family] never lived well financially. I even dropped out of school when I was 13 because we didn’t have money. Then I went to work at 14 years old. So I started and I don’t know why but in my first job I loved working, but later it didn’t amount to anything because again it was just that job that was good, in coffee. They paid me 200 Lempira [$8] per day, all week, without any days off. And it didn’t go that bad. But later in the next jobs it was different. I started to learn vocations, because supposedly there were good vocations. I was recommended enderezada de pintura so I learned it. But nowhere was the pay good. I managed to get no more than L900 [$37] per week. In Santa Rosa de Copan I was working in this for a while. I had to pay L3,500 [$144] for a room. I had to pay gas if I wanted to make food in the apartment, I had to pay the electricity. It was hard. Life was hard there. I started working at 13 and I know that really in Honduras you don’t get ahead much. And now that I’m 20… It’s hard to advance financially. You look for a way out. I left with debts that being there I couldn’t pay. At the beginning [the police] were a little more forceful. They started especially in the bridge [between Guatemala and Mexico] stopping us, stopping us, and they didn’t come to an agreement, it was just whatever they said. And so because some of us took another way, which was crossing the river on rafts, then they understood that really we were going to advance however we could. These people are motivated by hope. By hope. Because there are many who have gotten to here, and now I hear people saying that they want to go back. But because of what we’re doing there are a lot of people who are deciding to go through Guatemala now, there are a lot of people who want to come. Despite everything they’ve seen about how the journey is and all the paperwork. There are many who even so want to come.